Invest in PAYBO ICO (Initial Coin Offering) Lauch Fund for up to 7 times return in a few months. If you are an investor in ICO, Blockchain, Bitcoin, or a Crypto enthusiast looking for investment opportunities with quick and multiple returns, this is for you, if you are willing to act right now. Unlike many white paper ONLY ICO projects, the PAYBO ICO will fund the development of PAYBOOKCLUB Mobile App, with an active network of more than 14000 members, in to a content monetizing platform with several million members.PAYBO, already exists on the STELLAR Block Chain and s tradable on the Stellar Exchange, which means liquidity for its holders. This is not paybookclub EQUITY dilution. Please see INVEST menu for equity participation. Investors to Invest in ICO Launch fund of USD 1 Million. The investment will be guranteed by SAFE (Simple Agreement For Future Equity) and will be converted to Prefferd Shares in the event the ICO fails to raise at least 10% of the target fund of $100 Million. Investors share up to 7% of ICO Raise ($100 Million minimum) = USD 7 Million in proportion to the investors contribution. ICO Launch fund Investors will be allocated PAYBO at the best discounted rates if they chose to convert the proceeds to PAYBO after the ICO. We are offering PARTNER/PROMOTER positions to professionals (Advisors) with proven ICO expertise who can invest USD 10,000 in Crypto or Fiat in our ICO Launch fund. For Developerss, we are offering a position in the team for USD 1000, in Crypto or Fiat. The team together will share 7% of the ICO proceeds, in proportion to their participation. Please contact us to become an INVESTOR or a PROMOTOR (CONSULTANT/ADVISOR) using one of the QUICK CONTACT links in the footer of this page. Please visit https://paybo.club for more details about the PAYBO ICO and to purchase PAYBO. Here is the Tokenomics of PAYBO which explains the distribution of PAYBO and how it works as the utility token of Paybookclub platform. 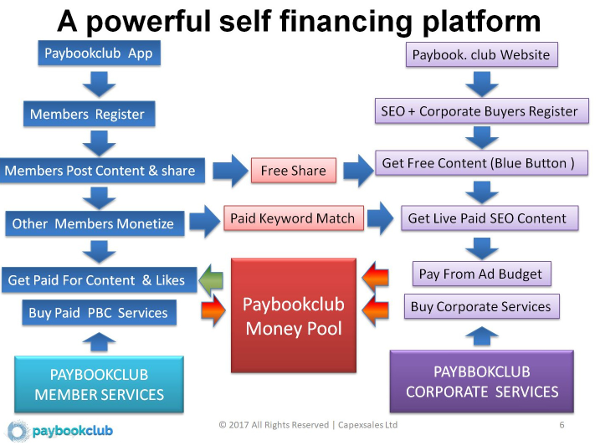 The Paybookclub platform will generate revenue for the Money Pool by monetising user generated content through multiple channels like advertising to pay the members for their time and content. PayboCoin will be its internal currency.